Detroit January 14, 2019; Big, brawny pickups along with super-fast, performance cars dominated the NAIAS on Monday as automakers pulled out all the stops in the never-ending battle for consumer attention in the ultra-competitive auto industry. Ford’s all-new 2020 Mustang Shelby GT500 was first out of the gate on Monday with a supercharged 5.2-liter V8 engine that produces more than 700 horsepower – enough to launch the car from 0 to 60 miles per hour in just over three seconds. Not to be outdone, Toyota President Akio Toyoda declared, “Supra is back! Better than ever!” as he revealed an all-new fifth-generation Supra that resurrects the nameplate for the first time since it was phased out in 2002. Toyota says Supra’s 3.0-liter twin-scroll turbo six will produce 335 horsepower and 365 pound-feet of torque. Lexus, which debuted as a brand at NAIAS 30 years ago, introduced the 2020 Lexus RC F and RC F Track. The Track Edition joins the standard Lexus RC F performance coupe which has been extensively updated for the 2020 model year. Improved aerodynamics, reduced weight, a retuned suspension and enhanced styling elevate the RC F to a new level of performance and refinement. Subaru said it will bring one of its “S” models to the U.S. for the first time. Subaru Tecnica International (STI), a wholly owned subsidiary of Subaru Corporation, revealed the limited-edition STI S209 – the car will be the most powerful model the Japanese automaker has ever offered U.S. buyers. It will be powered by a 341-horsepower, 2.5-liter Subaru Boxer engine. Performance numbers were also on display with the trucks and SUVs that automakers revealed. Ram unveiled a heavy-duty version of its pickup with a towing capacity of 35,100 pounds and a payload capacity of 7,680 pounds. When equipped with a Cummins 6.7-liter I-6 Turbo Diesel engine, the 2019 Ram heavy-duty 3500 pickup arriving soon at dealerships generates an industry first 1,000 pound-feet of torque. 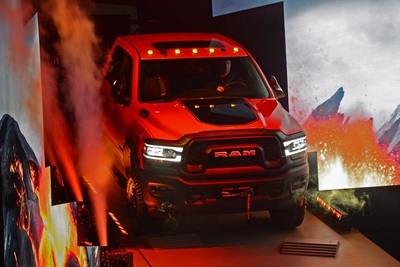 Ram also unveiled Laramie Black and Power Wagon versions of its heavy-duty truck. Kia revealed the Telluride SUV – the largest vehicle ever produced by the Korea automaker. The Telluride provides comfortable seating for up to eight occupants and is powered by a 291-hp 3.8-liter V6. Telluride is the first Kia designed specifically for the U.S. and is a product of the Kia Design Center in Irvine, Calif.
Volkswagen unveiled its new 2020 Passat eight years after introducing the first American-made version of the sedan. Volkswagen said its new Passat has a bolder design, upgraded technology, and enhanced access to convenience and driver-assistance features. Infiniti debuted the QX Inspiration – a mid-sized SUV concept that serves as a precursor to the brand’s first fully-electric vehicle. Infiniti is in the process of electrifying its entire vehicle lineup by 2021 and the brand said the QX Inspiration concept signals a new era for Infiniti design. The QX Inspiration was the second concept all-electric vehicle revealed at the show. Cadillac surprised journalists Sunday night when it showed renderings of an all-electric crossover. Dubbed “Cadillac EV,” the brand said the vehicle will be the first model derived from GM’s future EV platform. The Cadillac EV’s actual name and additional details will be revealed closer to launch, the company said. Cadillac executives also hinted at both a future Escalade and an upcoming performance sedan. Hyundai announced a new, sporty trim line for the Elantra GT called the N Line and announced a payment relief program aimed at helping federal employees furloughed during the government shutdown. GAC Motor introduced a three-row, seven-seat concept vehicle called the Entranze EV. It is the first concept vehicle designed in the United States by GAC. The Entranze is an SUV with glass sliding doors and a three-passenger front seat. • Richard E. Dauch, who worked at Chevrolet, Chrysler, and Volkswagen before retiring to found American Axle and Manufacturing. • Janet Guthrie, a pioneer in the field of auto racing. • Patrick Ryan, known for effectively establishing the finance and insurance business in the automotive dealership industry. • Sergio Marchionne, former CEO and Chairman of Fiat Chrysler Automobiles who died unexpectedly last year. NAIAS’ Press Preview will continue on Tuesday with news from several major auto suppliers and will pivot to panel discussions at AutoMobili-D.
• MAHLE, Atrium Stage 10:20 a.m. – 10:45 a.m.
• MEDC/PlanetM, Atrium Stage 11:00 a.m. – 11:25 a.m.
• Techstars, Atrium Stage 11:40 a.m. – 12:05 p.m.
• INDYCAR 12:15 pm – 12:40 p.m.
• PlanetM Startup Competition Powered By Techstars, PlanetM Stage 12:30 p.m. – 4:30 p.m.
• Detroit Mobility Lab Special Announcement, Atrium Stage 1:30 pm – 1:55 p.m.
• EyesOn Design, Atrium Stage 3:40 p.m. – 4:40 p.m.
• PlanetM Awards, PlanetM Stage 4:30 p.m. – 4:50 p.m.